From the outside with its picket fence, slate roof, bay windows on either side of the front door, and a row of sash windows above, Gemma Wightman’s pretty Victorian home is as symmetrical as a child’s drawing of a house. Fitting, since it’s the home Gemma shares with her young daughters Matilda and Lola. It’s also the backdrop to the beautiful luminescent porcelain tableware, which Gemma makes by hand in her garden studio and displays in her home. Her mugs, tea sets, plates, bowls and pitchers in soft creams and duck egg blues are all individually produced, each stamped ‘approved by Matilda and Lola’ on the base. It was the need for a home studio that prompted Gemma’s house move in 2012. ‘Matilda was 18 months old and I’d just had Lola. I decided it would be a lot easier to work at home, so I started looking for a house either with a studio already built, or with enough space to build one. Before that I’d been living in London and working in a co-operative in Wimbledon,’ says Gemma. The biggest selling point from Gemma’s point of view was the detached building in the garden, a former outhouse that had been converted into a separate apartment, already set up with lighting, heating and its own bathroom. ‘The kitchen was dominated by a massive island, in a dark-mahogany colour, that took up most of the room,’ she says. But conscious of her budget and keen to upcycle, Gemma got a local carpenter to cut the island in half and remodel it into the run of units now fitted around the Aga and window, and make doors to match the existing cupboards around the sink. A lick of paint across all the units and some new pale grey quartz worktops, and the kitchen was transformed for family life. Gradually, room by room, Gemma then decorated the whole of the house, adding character and style: ‘I literally painted around the children, moving their toys from room to room as I went,’ she says. 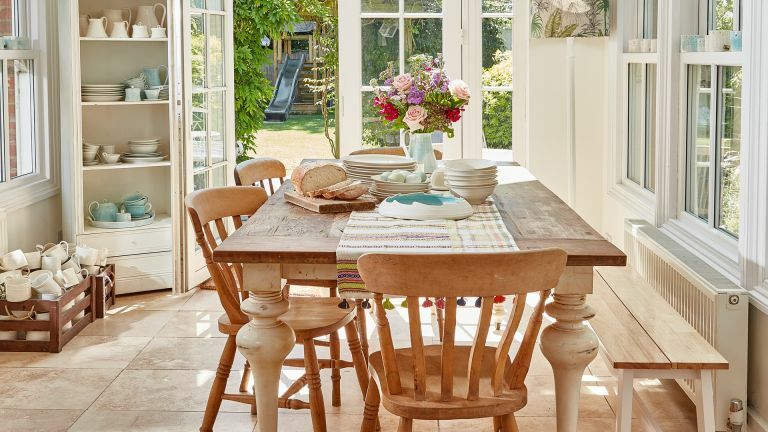 Light, airy and furnished with a mix of antiques and fresh contemporary pieces, the Victorian villa is unrecognisable from how it was when the family first moved in. "I literally painted around the children, moving their toys from room to room as I went"